EcoPayz is an e-wallet that started out life as EcoCard in 2000 and has now established itself as one of the premium online payment systems. The primary advantage that EcoPayz Online Casinos bring to Canadian online gamers is the added layer of security it provides by not requiring you to share your financial details (such as bank account and credit card numbers) directly with the casino. In this article we highlight the advantages/disadvantages of using EcoPayz and how to go about using it as a payment method at online casinos. Safe and Secure: The first and probably most important of these is that it is safe and secure reducing the risk of your financial details being stolen or used inappropriately. The reason for this is that you only share your bank details and/or credit card numbers with EcoPayz not the online casino where you play (or any other third party for that matter). All transactions are anonymous and so the casino where you deposit funds is not privy to your personal details. All transactions using EcoPayz are encrypted from your browser using Secure Sockets Layer protocol or its successor Transport Layer Security protocol, depending on your browser capabilities. Immediate Deposits: In terms of getting your casino account up and running, deposits made using EcoPayz will hit your account instantaneously. A good number of online casinos accept EcoPayz as a payment method, making it a valuable tool irrespective of where you decide to play. Similarly unlike some other payment methods you can use it to withdraw funds from your casino account as well. Keeping tabs on deposits: Being a digital wallet similar to iDebit rather than a credit card means that you are more able to keep tabs on your bankroll management ensuring that you are only playing with money that you have available. This avoids the risk of unknowingly running up credit card bills or moving into your overdraft. 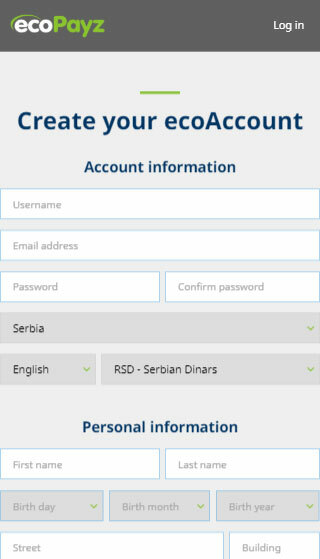 Accessibility: Operating an EcoPayz account is easy and straightforward and your account is always accessible. The site can be accessed from your mobile and iOS and Android users can download an app for greater convenience. Similarly, there are a variety of different methods to deposit funds into an EcoPayz account including bank wire transfer, credit cards and alternative digital wallets. No matter where you bank, who you bank with or how you run your financial affairs, getting cash into your ecoAccount is always quick and convenient. Depositing funds charge: Although it is free to transfer cash from your EcoPayz to your casino account, there is a charge for depositing funds into EcoPayz, ranging from between 1.69% – 2.9% (depending on the region you live in). And while it is possible to make payments to merchants and service providers in 45 different currencies, there is nevertheless a currency conversion fee charged if you transfer money in a currency other than that you used to make a deposit (between 1.25% – 2.99% depending on your Membership level). Dormant Account: A further potential disadvantage is that if your account remains dormant for 12 months, you’re then charged a monthly recurring fee, although for regular online casino players who use EcoPayz as their main e-wallet this shouldn’t prove to be too much of an issue. 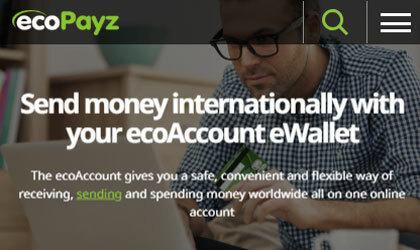 The first step to setting up an EcoPayz account is to visit www.ecopayz.com. There you can get an overview of their services and be taken through the sign up procedure. You will then be sent a confirmation email to fully activate your account. Thee are four different account levels – Classic, Silver, Gold and Platinum – and the services offered and the fees charged are in accordance with the level you have attained, which is calculated according to your account activity. 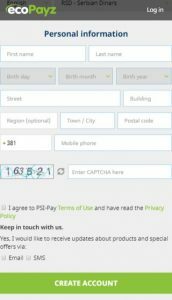 On joining, you are instantly given Classic status, although to gain the most from EcoPayz’s services you should seek to upgrade to Silver as soon as possible. This is relatively straightforward to do and requires you to provide identification documentation, such as a copy of your passport or driver’s licence, and proof of your address e.g., a utility bill, a bank statement, etc. There are a wide variety of methods you can use to transfer funds to your EcoPayz casinos account, either using direct bank transfer or via a credit/debit card. Depositing funds is quick and easy, with the fee charged dependent upon the method used and the region in which you live. Whilst there are quite a lot of complaints about their customer service, they do provide a service that makes it easy to transact with casinos and the debit card they provide comes in handy allowing you to make direct purchases or withdrawals from an atm. 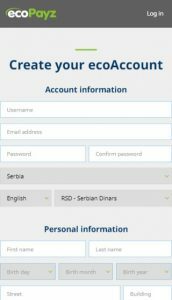 Are there any EcoPayz bonus promotion? How do you upgrade to different membership levels? Going from Classic -> Silver requires you to provide identifcation documents for verification. Silver membership status for minimum 30 days. A cumulative transfer of 25,000 Euros to merchants. EcoPays is operated by UK based company PSI-Pay Ltd.